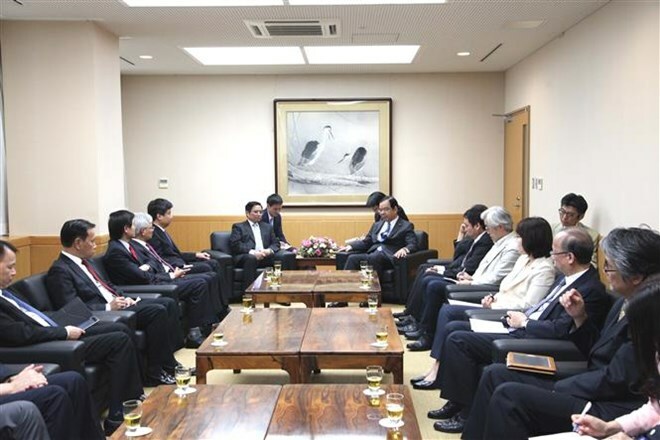 Tokyo (VNA) – Chairman of the Japanese Communist Party (JCP) Shii Kazuo hosted a reception for Pham Minh Chinh, Politburo member and Secretary of the Central Committee of the Communist Party of Vietnam (CPV) and his entourage in Tokyo on August 27. Chinh congratulated the JCP on its new progress after its 27th congress as well as its success in the Tokyo council election. He briefed his host on Vietnam’s current situation and the seventh theory exchange between the JCP and the CPV, while discussing measures to consolidate relations between the two parties. For his part, Shii Kazuo expressed his delight at the fruitful results of the seventh theory exchange as well as the growing partnership between the two parties over the past years. He thanked the CPV for its support for the JCP, expressing his hope to further strengthen the solidarity, trust and cooperation between the two parties in the future. On August 26-27, the CPV delegation led by Pham Minh Chinh conducted the seventh theory exchange with the JCP led by Fuwa Tetsuzo, former JCP Chairman and head of the JCP’s Social Science Institute.